Even in the virtual world, you can run out of real memory.That was the case at the $1.8 billion Grow Financial Federal Credit Union in Tampa, Fla., where its technologists recently completed a revamp of its virtual data center. 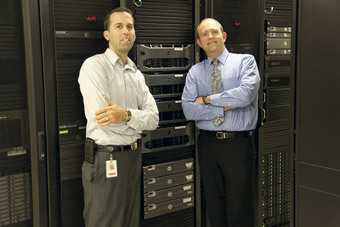 Stephen Sanderfer (left), Grow Financial’s telecom analyst, and James Stock, the assistant vice president of network services. Even in the virtual world, you can run out of real memory.